Well done to all the athletes who participated in the 2010 Dublin Team & Relay Championships, which took place on a very sunny Saturday 2nd June 2018. Full results can be found here. Below is a summary of DSD athletes who medalled at the championships. These athletes qualify for the All-Ireland Team Championships which will be held in Tullamore on 1st July, 2018. Parents please confirm your son/daughter is available to attend the All-Ireland on 1st July, 2018. Girls U9 – Laura Mulqueen & Victoria Lynch, 2nd place in Long Jump. 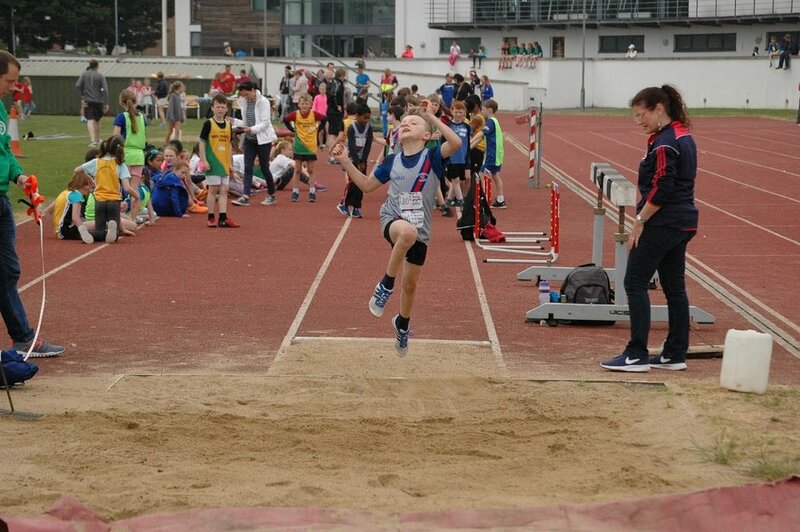 Boys U9 – Donal Clair & Oran O’Sullivan, 3rd place in Long Jump. Girls U10 – Evelyn Kwik & Tess Archer, 3rd place in 60m. Boys U11 – Cian Dunphy & Matthew McCarthy, 1st place in 60m & 2nd place Long Jump. Boys U11 – Ryan Nunan & Johnny Ellis, 3rd place in Long Jump. Boys U11 – Adam Mulqueen, Cian Dunphy, Matthew McCarthy, Johnny Ellis & Ryan Nunan. 1st Place in 4 x 100m Relay.